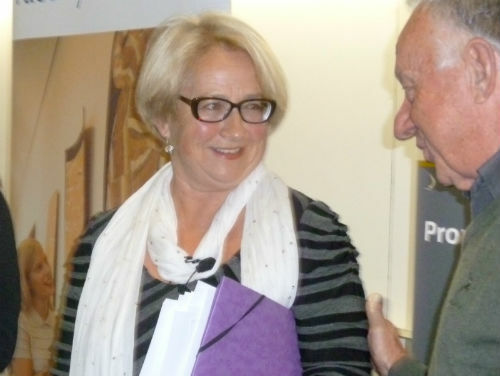 Prof Barbara Pocock gave the 2015 Academy of Social Sciences in Australia Fay Gale Lecture on 18th August to a full audience. Her lecture was entitled: “Holding up half the sky? Women at work in the 21st century”. It explored the consequences of the most significant change in the Australian labour market in the past four decades – the growth of women’s participation in paid work. Barbara began with a description of her job as a rouseabout in New Zealand in the early 1970s and reflected on what she had learned about work through that experience, and since, in roles in higher education, government and union movements. Barbara noted consistent features of work: it is hard labour, it entails power relations, it requires collective action to protect workers, it holds meaning for people beyond financial rewards … and work is highly gendered. She wove stories and statistics together beautifully to make the following points. Women now spend most of their adult lives in the paid workforce (with 50% working part-time). This has changed dramatically from the late 1960s. Over the same period, there has been little change in domestic arrangements (although we won’t know about this in the future as the Australian Bureau of Statistics no longer collects these data). But women are still viewed as ‘the stranger’ in the workplace. The ‘ideal worker’ norm is constantly being refreshed and refashioned. The worlds of time (work and home) that women have to combine are a source of tension, as care involves a degree of unpredictability. So working women, more than men, report always or almost always being ‘rushed or pressed for time’; for women who are mothers this is the experience of 70%. Although workers gained the right to request flexibility, there has been no change in the proportion doing so. The data pattern suggests that those who feel secure in their jobs ask, but those who lack power (‘discontented non-requesters’) cannot risk doing so. Barbara examined the current government’s paid parental leave plan and the promise of workplace entitlements for women. Despite this plan being promoted as vital to support women having a baby and a career, it received public criticism with women portrayed as ‘double dipping’ the system. Similar cries of double dipping are not levelled at people who access retirement funds (which come from a variety of sources), and Barbara noted the cynicism directed towards important equality measures aimed at women. Barbara specifically noted that workers in the aged care and disability sector (who are likely to be our daughters and granddaughters in the future) require better work conditions. Reducing penalty rates on Sundays in designated sectors (e.g. hospitality, retail) will disproportionately affect women in low paid work. The sectors that are protected due to “long held community expectations” (e.g. mining) are male dominated and much better paid. Barbara’s own Australian Work and Life Index (AWALI) data have been misused to support the claim that workers in the designated sectors are happy to work on Sundays and it is not detrimental to involvement in family or community. The institutional response to women has been partial, tentative, debated. To gain equality at work we need a different approach. We need: (a) an organized approach to collective action; (b) really good research; (c) to hold our political parties accountable. To protect all workers, especially low paid and vulnerable female workers now and in the future, Barbara argues that we need to recognise that the proliferation of different forms of employment will not be halted by requesting or expecting a return to traditional full-time standard permanent jobs. We need to be proactive and inclusive in thinking about decent labour conditions fit for the 21st century. This entry was posted in News and tagged equality, gender, lecture, women. Bookmark the permalink.